What do you do when you have a garden full of minty fresh plants that threaten to take over? 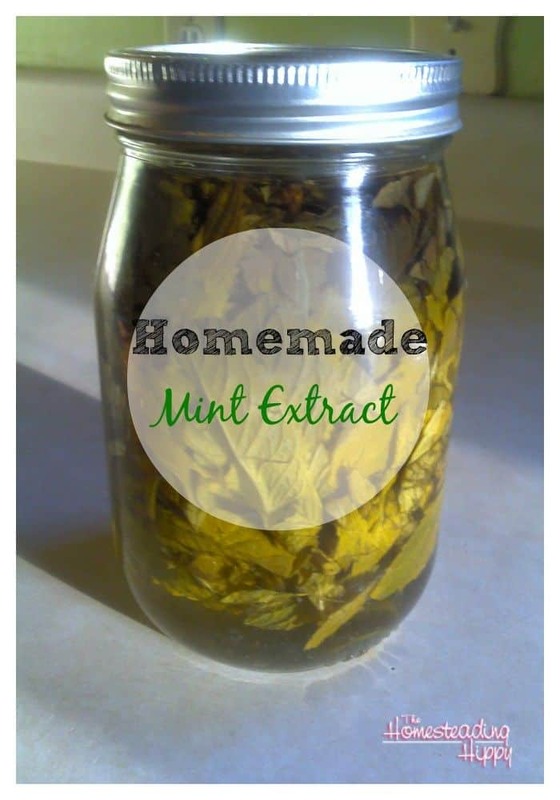 You make your own homemade mint extract! I have this garden full of mint. I got a small plant one year from a “friend” and now, I can’t seem to control it. Had I known then what I know now about the invasive-ness of mint…I would go back, and plant it in a large pot, not just allow them to stick in the ground where it “would be pretty”. Oh, how naive I was about this evasive plant! It went EEEEVEEERRR-EEEE where!!! Anyway, I digress. I decided that I am going to stop complaining about this mint, and go to work using it. I’ve made tea until I can’t drink anymore, and I already have mint jelly nightmares. So, I decided to try some homemade mint extract. Just like the vanilla extract but with mint leaves instead. Harvest your leaves by snipping off the stem. Wash gently to remove any bugs or dirt. Dry thoroughly to remove any water. Slightly chop to “bruise” leaves to release oils. Place clean leaves in a quart sized jar, packing tightly. Cover with grain alcohol, such as vodka, leaving 1/2 inch headspace from the top of the jar. Store in a cool, dark place for 2-3 weeks, shaking daily. After 3 weeks, strain out plant matter and bottle your extract. To see how to make other extracts, including alcohol FREE versions, check out the post here. Do you make your own extracts? What’s your favorite one to make? Have you ever tried peppermint ice cream? Very refreshing! I have one of those Cuisinart counter-top ice cream makers and that is my absolute favorite recipe. I don’t have peppermint in my garden – I have spearmint instead. But I’m going to try this for spearmint extract. oooooh!!! peppermint ice cream!! now, why didn’t I think of that??? thanks!!! All the mints are usefull for headaches, nausia, upset stomach, and for cold and flu. The standard brew is a handful of leaves to a cup of boiling water, sweeten with honey. can be taken several times per day. Mint leaves rubbed over sore joints will bring ease and comfort. Arthritis and rheumatism sufferes have found much relief in using mint as an external rum as well as a bedtime drink..Steep mint leaves that have been crushed in apple cider vinegar for 24 hours and then use these leaves as a rub. I have lots of rum. Can I make mint extract with rum, instead of vodka?